Do you like watching the Discovery Channel? Do you like finding out about news from the world of science? Well if you do, then this brilliant free iPhone and iPod app is for you. The Discovery News app allows instant access to news stories from the Discovery News website, directly on to your iPhone. The articles are written in easy to read language and each story gives a brief bulleted summary first. You can also view videos from the channel on your iPhone. 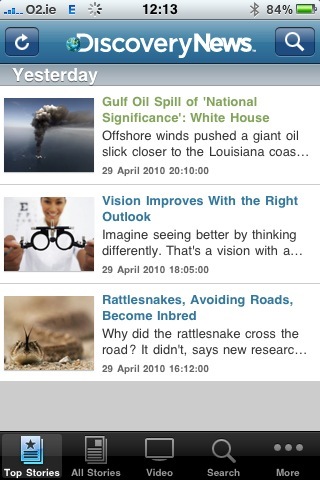 There are some brilliant science news apps but this is the best free app available, in my opinion. You can also share your favourite news stories by email or add them directly to your Twitter page. The app also has a search feature. The only downside is the advertising banner on the bottom of each page. But, hey, it's free! Click here to view in iTunes and download. Why I Love my iPhone ... and its Apps!